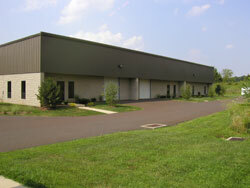 4,000 square foot flex unit in building which was completed in 1999. Approximately 500 SF office space with two bathrooms and with mezzanine overhead. 16' clearance in warehouse area, drive in overhead door, loading dock door, plenty of parking, direct access to Route 611 just North of Plumsteadville. Natural gas heat in warehouse, heat pump with AC in office area, 3 phase electric which high voltage available, and broadband. $8.50 per square foot NNN. 2,000 square foot flex unit in building which was completed in 1999. Approximately 250 SF office space with one bathroom and with mezzanine overhead. 16' clearance in warehouse area, drive in overhead door, loading dock door, plenty of parking, direct access to Route 611 just North of Plumsteadville. Natural gas heat in warehouse, heat pump with AC in office area, 3 phase electric which high voltage available, and broadband. $8.50 per square foot NNN. Future condo flex units available. Anticipated occupancy in 2008. 5,000 to 20,000 units. See rendering and floor plans for details.